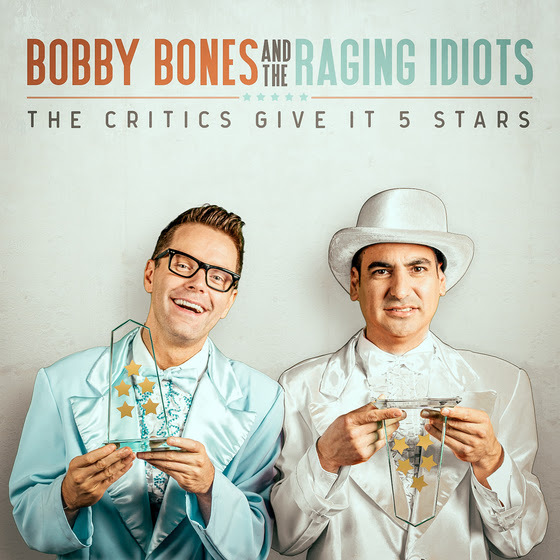 Bobby Bones and The Raging Idiots are set to release their first full-length album, The Critics Give It 5 Stars, on March 18, via Black River Entertainment. Bobby Bones, who recently nabbed his second ACM award for National On-Air Personality of the Year, co-wrote all the tracks on the album, which takes satirical and deliberate cues from today’s popular music, including the group’s lead track “If I Was Your Boyfriend,” the soon-to-be millennial-favorite “Netflix Love Song,” as well as offering fans two versions of the witty and instantly-infectious track “Starbucks!” depending on their personal genre preferences. The album also features some of Nashville’s top songwriters including Lee Thomas Miller and Kristian Bush. The music video for “If I Was Your Boyfriend” made its debut on CMT and is available now on iTunes. Continuing in the charitable spirit that made The Raging Idiots a household name and raised over two million dollars for charities across America, a portion of the proceeds from “We Can’t Stand Each Other” with Carrie Underwood are being donated to St. Jude Children’s Research Hospital. Additionally, fans can pre-order autographed copies of the entire album along with other unique merchandise offers at www.ragingidiots.com. A portion of the proceeds from each package will go to Musicians On Call.